For many people, having good skin is important. What’s the secret to good skin? Using the right products and treatments that work for you. With more and more people using skin care products, skin care treatments are also on the rise; with facial massage becoming a favorite at your local clinics and salons as a way of pampering yourself and improving the look and feel of skin. But get this, you don’t need to go to an expensive skin clinic in order to treat yourself to a facial massage, as you can do it yourself from the comfort of your own home. With the help of a facial oils such as Teddie Organics Rosehip Seed Essential Oil, facial massage can be done anytime, anywhere and by anyone! Teddie Organics Rosehip Seed Essential Oil is a good component for that coveted and well-deserved face massage wherever one may be. Subjecting the skin to face massage regularly will give the users several wonderful benefits, and doing it with this facial oil can maximize the benefits that one can enjoy out of performing face massage. One particular and very advantageous feature of this facial oil is its anti-aging effects. With the help of this essential oil, and coupled with regular face massage, wrinkles and other aging lines not only can be prevented but also alleviated to give its users a youthful and glowing complexion. The anti-aging property is not all there is to the facial oil, though. It also has some ingredients that can heal scar tissues, soothe burned skin, and treat rashes and other skin conditions such as stretch marks. Another nice thing about this particular facial oil is it is all natural, for it is made up of organic ingredients. There is no need to worry about harmful chemicals with this facial oil because the essential nutrients found in this one are all natural. Rosehip Seed Oil is organic and cold pressed. The content is not only the nice thing about this facial oil, for its packaging is also something to be noted well. The facial oil in encased in a bottle tinted a dark amber color so that light seepage can be avoided. To add, the facial oil comes with a dropper top that makes using the oil easier and less messy. As a bonus to buyers, this facial oil comes with a manual that gives ideas on how it can be used for other purposes aside from being a component for facial massage. Finally, the best thing about this facial oil is that it is compatible with any or all skin types. Whether one has oily or dry skin, it does not make any difference – this particular facial oil can be used for either. There are no sensitivity issues or wasted money to fear, as this facial oil will work well with all types of skin. And to make the entire package better, the manufacturer of this facial oil offers a Risk-Free Lifetime Guarantee, which means that if purchasers are not satisfied with the product they can choose to return it or keep the bottle and the purchase price will be refunded. Teddie Organics Rosehip Seed Essential Oil also has its own set of disadvantages and downsides. Take, for example, feedback from purchasers that the facial oil has a light scent to it and comes with a very light color compared to other organic rosehip oil, which could mean that the facial oil is not as organic as it claims to be. Also, there is also feedback that the facial oil is not easy to dry and not very absorbent so it takes quite some time before it is completely absorbed by the skin. Hence, it is recommended that the facial oil is used moderately and in very small amounts so that the oily feel can be avoided. 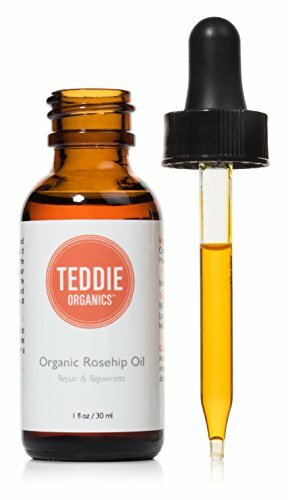 Teddie Organics Rosehip Seed Essential Oil may have its own upsides and downsides but the overall assessment of the product is it is still a good catch and a good skin care product. The negative feedback about the facial oil can be easily avoided or addressed, so the downsides are merely minor ones that do not discount the facial oil’s effectiveness.